Lately, I’ve seen a lot of chatter on the net about bad packages when trying to install software, licenses, run builds, ect. Even the simplest processes can have a hidden gotcha that could result in you pulling your hair out. Here is the most common reason that I’ve found for that range of problems. 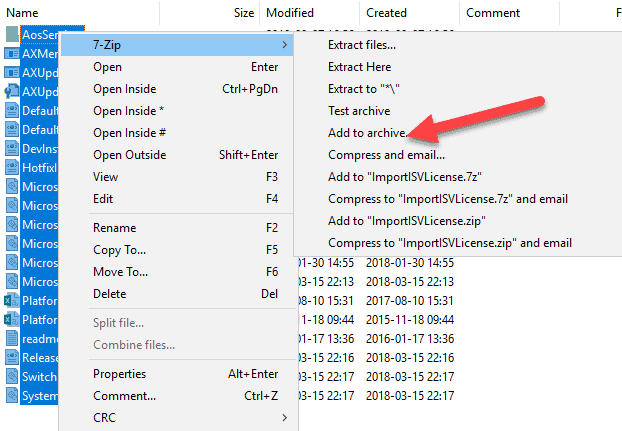 We’ll take the simple example of installing a license file in Dynamics 365 for Operations and getting the invalid “HotfixInstallationInfo.xml” error, but remember that this could apply to anything with packages. It’s a simple but very common hidden time waster. 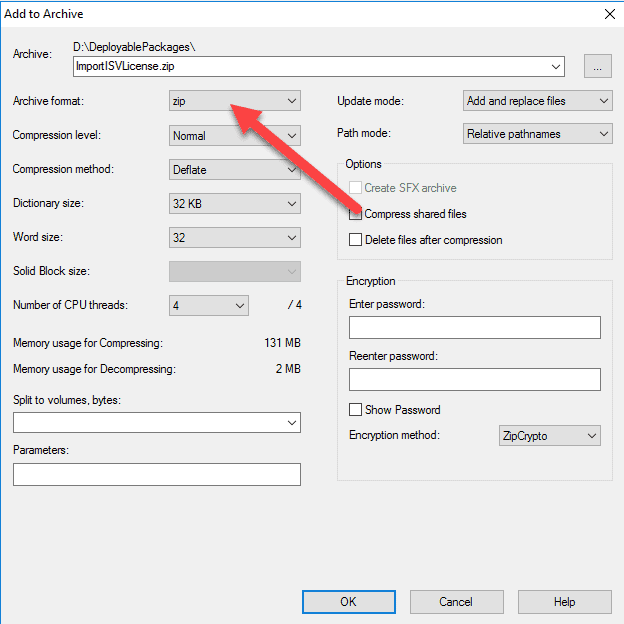 Note, the drive where the AOSService is located changes per the data center that it is deployed from and the version of D365. The directory structure has not changed as often though. For example, here I copied it in the D Temp drive and put it in a folder. Actually, you can but the windows default package zip can mess up other package related activities also like builds. So, it’s safer to just skip it. 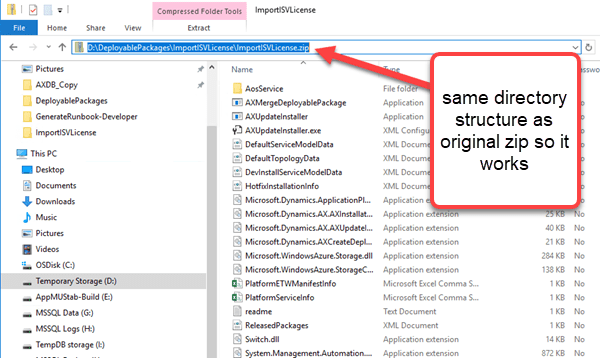 What happens here is that if you unzip the package and rezip it with the windows option, it messes up the structure of the folder by inserting an additional folder in there. Shame, shame.. bad.. bad.. It messed up the folder structure in the zipped file which can cost you all kinds of time trying to figure out what is wrong. You needed to just be able to go in and open up the files. Then, I turned around and hit the drop down on the Archive Format and changed it to Zip. And notice how the directory is all good now if we open it. Now, with that fixed, you can upload the zipped package to lifecycle services Asset Manager, live happily ever after, ect.. In summary, that’s it. It’s always the little things like a folder structure that can cause so many headaches. I’ve seen a large number of posts with people spending hours trying to figure this out but had not seen the solution explained anywhere yet. 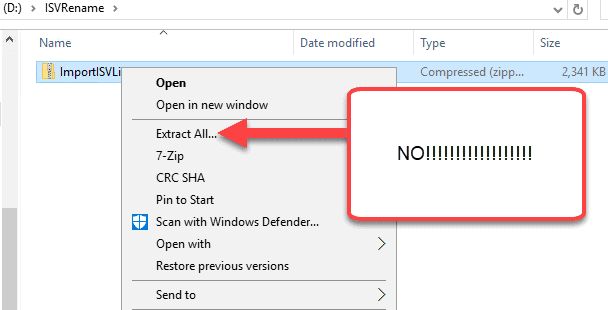 Yes, you could have gotten it working through the windows send as zipped option but 7zip is far better. I hope this helps everyone to regain some of that precious time and enjoy. Happy Friday!